Maintaining a healthy diet is very important when you are trying to promote weight loss. Losing weight is mostly about what you are eating, although exercise can help too. For the most part, the success of your weight loss endeavor is going to hinge on the foods that you decide to eat. One of the most effective weight loss programs that people make use of today is the ketogenic diet. The ketogenic diet, also known as keto, involves avoiding carbohydrates to put yourself into a ketogenic state. While in this ketogenic state, you will have a much easier time losing weight. This has helped many people to reach their weight loss goals in a simple and achievable way. If you have heard the success stories of certain people who have tried the keto diet, then it makes sense to want to give it a whirl yourself. Most keto diets are very reliant on eating meat but this isn’t going to mesh well with the sensibilities of everyone on the planet. There are many people who are turning to becoming vegan or vegetarian due to their beliefs and convictions. If you are wondering whether you can maintain a successful keto diet while still being a vegetarian, then the answer is yes. You can get all of the nutrition that you need while still maintaining a vegan keto diet. It may take some extra planning but you will be able to accomplish your goals. It should quickly be noted that there is a difference between veganism and vegetarianism. There are also several different types of vegetarianism so you will need to determine which type you want to be before moving forward with your keto diet. It actually isn’t that difficult but you still need to be prepared for planning out your nutritional needs. If you don’t go into the new diet ready, then you may have a tough time getting all of the nutrients that you need. The different levels of vegetarianism are pretty easy to understand. Many vegetarians simply do not eat meat but they will consume animal byproducts. These types of vegetarians are referred to as lacto-ovo-vegetarians. There are also vegetarians who eat eggs but not dairy products and they are called ovo-vegetarians. The last type of vegetarianism to consider is when people eat dairy products but not eggs and they are known as lacto-vegetarians. Vegans take things all the way by not eating meat, dairy products, or eggs. Knowing this, you will need to find nutritional replacements for any of the food products that contain these items. Maintaining a true vegan keto diet may seem challenging at first but it can be accomplished. You just need to know what you’re doing and you should look for the best low-carbohydrate vegan cuisine. The most difficult part of maintaining a keto diet as a vegetarian or vegan is going to be restricting your carbs. Many of the foods that you have come to rely on as a vegan or vegetarian contain higher amounts of carbs than a keto diet will allow. You are going to have to severely limit your carb intake in order to achieve the proper results. This is not going to be impossible but you will need to be careful not to become deficient in certain important nutrients. The primary concern about this diet with vegans and vegetarians is not being able to get enough protein. This diet is a lot easier for people who can eat meat in order to get the proper protein that their bodies need. Vegetarians and vegans will need to get a little more creative so that they can maintain the diet. You will need to really look at the carbs that you are taking in and cut certain things out of your diet entirely. The net carb intake that you should stay under every day is only set at 20 grams. That is a really low number and it may prove difficult to you at first. Even so, it is something that could be worthwhile for your overall weight loss goals. If you want to use the ketogenic diet to get your body into the best shape possible, then you will be able to make it happen. It is just going to take effort and careful attention to detail when planning your meals. Eating protein with every meal is going to be in your best interests. It is said that most people need between 60 and 100 grams of protein every single day while they are on a keto diet. Since you are not going to be able to get that protein from meat, you need to find another source that will work well. There are plant-based foods that can provide you with protein and are also low in carbohydrates. 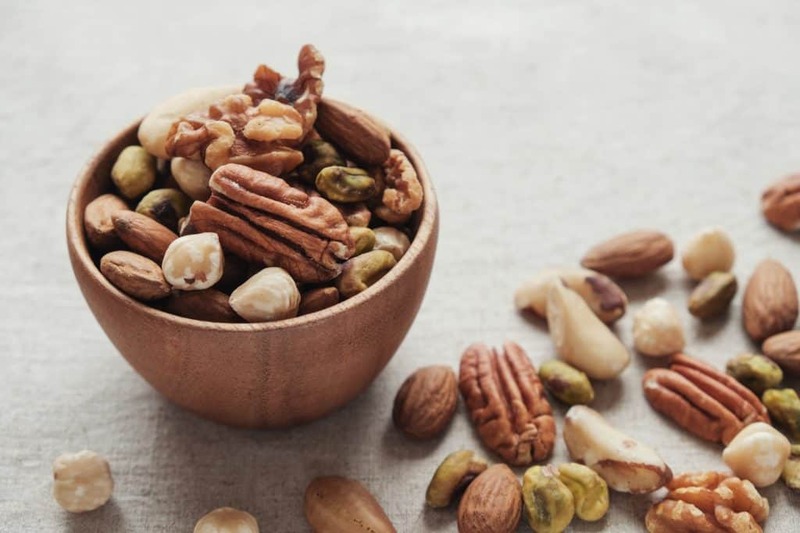 A good example of the protein sources that you will be relying on is nuts. These can be eaten regularly without adding too many carbs to your daily diet. They will give you an important source of protein and should be very helpful on this diet. Certain types of seeds can also be useful to help you get some protein in your diet. If you are a lacto-ovo-vegetarian, then things will be even easier. If you can consume eggs and dairy products, then you will be able to get your protein from some convenient sources. Greek yogurt and eggs can act as a lifesaver on this type of diet. Eggs are especially useful for getting a lot of protein into your system without adding in too many carbs. If your version of a vegetarian diet allows for eggs, then you should certainly keep them stocked in your refrigerator. Other sources of protein that you can make use of include cheeses, peanut butter, and almond butter. Of course, you can only make use of the cheeses if your specific version of a vegetarian diet allows. Also, vegans will need to find other sources. This diet is most difficult for true vegans and a bit easier for certain types of vegetarians. The benefits of following a vegetarian diet are vast but you will need to be careful while trying to pair it with keto. Your keto diet vegetarian needs may seem difficult to meet at times but you can ensure that everything will work out well. Vegetables are typically a staple of any type of vegetarian diet. While you are trying to adhere to keto principles, you will need to be more careful about the types of vegetables that you are consuming. Not all types of vegetables are going to be fair game for you any longer. For instance, there are many types of vegetables that are high in starch. This can add too many carbs to your daily intake and will completely throw off your ketogenic balance. You need to avoid this so picking out only the vegetables that are low in carbohydrates will be an important part of your success. Luckily, there are many delicious vegetables that you will be able to count on during this diet. Some of the best vegetables for the keto diet include spinach, avocado, Brussels sprouts, cauliflower, and zucchini. All of them will be delicious and will provide you with some very important nutrients. Spinach can give you a great source of iron and potassium while keeping your carbohydrate intake low. Brussels sprouts are rich in both vitamin C and potassium so you can see how useful vegetables are going to be. You should endeavor to eat one to three servings of these low carbohydrate vegetables every day. As long as you stick to the low-carb vegetables, you should be fine. If your favorite type of veggie is not mentioned above, then look into it to see how the carbohydrate numbers look. It may be able to fit into your diet and it will make things more pleasant for you. Cooking with healthy oils while on your diet will be very helpful. You need a good source of fats and healthy oils will be able to provide what you need. Coconut oil, olive oil, and avocado oil pair up nicely with the keto diet. You can improve the taste of many of your dishes by cooking with these oils. They will also offer you some nutritional benefits so put them on your shopping list. Other sources of healthy fats will be useful too. For example, you could make use of keto-friendly salad dressings and condiments such as butter or ghee. Obviously, you will need to make sure that any salad dressings and butter is capable of fitting in with your brand of vegetarianism. Just remember that you do want healthy fats as a part of your diet and that oil, salad dressing, and condiments can be beneficial. You should also seek to spice things up whenever possible. Making sure that you enjoy your meals as much as possible is quite important. When you enjoy your meals to the fullest, it makes the keto diet seem easier. The right spices can help you to get the most flavor out of your meals so that you don’t get fed up with things. Making use of various types of herbs and spices in your meals will be a safe way to keep yourself happy. You can add a lot of flavor to a dish while only putting in very few carbs with the spices and herbs. It should work out nicely and you will feel better about the diet overall. This advice can really make your time on the keto diet more enjoyable so don’t forget to use herbs and spices to their full potential. One problem that people have with the keto diet is that they sometimes wind up getting bored with it. If you feel as if you are stuck in a rut by eating the same foods all of the time, then it can be difficult. You do not want to lose your motivation while on the diet so it is crucial to keep yourself happy. You need to have access to snacks, meals, and other types of foods that will keep you pleased enough to make the diet feel natural. The best way to go about helping yourself is to seek out vegetarian keto diet recipes. There are many recipes online that can help you to keep your diet interesting. People have become really creative when it comes to crafting dishes that adhere to both vegetarian and keto principles. Taking a look at some of these recipes will show you that there are so many delicious possibilities. If you feel bored with the diet now, then you won’t if you try out some fresh recipes. If you are having a really tough time maintaining a keto diet for some reason, then you could consider trying pills. Recently, companies have started creating pills that will give people the effect of a keto diet without forcing them to adhere to the strict principles of keto. You can get into that ketogenic zone by using these pills instead of doing it with your diet. Some examples of popular pills on the market include premier keto diet and keto ultra diet. Both of these sets of pills have proven popular among certain people. They can give you a good boost to your metabolism and will mimic the effect of a natural keto diet. If trying to do the keto diet is too tough for you to pair with your veganism, then these do exist as an option. You can look into the details of them and whether or not they are going to be worthwhile for your specific situation. You should know that the actual keto diet is going to be the most effective method, though. If you can make the dietary adjustments so that you can adhere to keto, then you will see good results. It can be done but these pills are there for people who are struggling. You just need to know all of the options that are on the table.